Patrick and me as freshmen in 2011. Patrick's background is in soccer while mine is in figure skating. The Freestyle Libre is a small device (about the size of two stacked quarters) that goes on the back of the upper arm. Its continuous monitoring helps spot highs and lows...a.k.a. less stopping on runs and stressful questioning about where glucose is heading. Patrick O’Brien and I became friends in August 2011 like most college freshmen become friends…trying to make conversation with total strangers. We were waiting outside the classroom for Nutrition in Health and Disease talking about how we were happy to get into the seminar. At the time, both of us wanted to be dietitians. I told him my interest stemmed from sports and living with type 1 diabetes. He told me he was on the varsity soccer team and then pulled out his insulin pump. We’ve been friends ever since. Fast-forward 6 years to December 2017. Pat is at Simmons in Boston to become a sports dietitian and I had just received acceptance to the University of Virginia School of Medicine (a slight change of career plans). Since I got into my dream medical school, I figured it was time to start thinking about the things I wanted to do before starting. Travel…a lot. Yes. Run a race? Yes…run a race. A full marathon? Maybe. I had been looking at races, but decided that there was only one race I would train for 26.2 again: Boston. Which would have required re-qualifying prior to September…guess that one was off the table. I happily planned on a half instead. Cue Angela from Abbott. I had first gotten in touch with Angela when I ran the Boston Marathon in 2015. My dad had gotten a picture of me with my Freestyle Lite meter after the race and we thought it would be a good idea to send it to Abbott’s PR team. Unbeknown to me, they now had a marathon program to celebrate the amazing things humans are capable of when enabled through health technology. People with T1D are perfect examples as we trust our lives to the power of AAA batteries and the preciseness of the pistons (object that pushes insulin through the tubing) in our insulin pumps. Seemingly out of the blue, Angela asked if I had interest in running Boston 2018 with an Abbott bib. No qualifying required. Just a heck of a lot of training and using the Freestyle Libre flash glucose monitoring system to help manage my glucose throughout. (What is this life sometimes?!). She also asked if I knew another T1D athlete who would be willing to do the program….a.k.a. do you have any other athletic, just-crazy-enough friends with T1D who would agree to run the Boston Marathon? Turns out, Pat had already been training for a half, but Boston was on his bucket list. He said he would think about it…which really didn’t take all too long. Pat was in. It took some convincing to prove that he was up for Boston as his very first marathon, but here we are one month out from the Boston Marathon…Pat is training at not only a good pace, but a great pace (7:15 on an 20-mile long run!) AND is on Boston’s terrain. He rose to the occasion and I couldn’t be happier to have him by my side (before passing me) at the Boston Marathon on April 16th. Here we sit down with Pat to get an idea of his training, balancing T1D, and what he’s most excited about for Boston 2018. Patrick outside the famous Marathon Sports on Boylston Street. So Pat, what has been the most surprising part of training as a first time marathoner? The most surprising aspect of training has been the planning that goes into my runs each week and the time commitment the process entails. I’m readily texting my uncle, who is an experienced distance runner, for a breakdown of the distances and paces I should be doing each week. I’m surprised with how much I’ve fallen in love with running. I’m not sure if it’s the competitive spirit in me, or the air in Boston, that motivates me to balance the time consumng runs with my busy work weeks and projects. Where did your training start (pace wise, etc.) and what has helped you achieve the success that you have? I’ve abided by the philosophies of “You don’t know your true self until you challenge yourself” and “There’s never a finish line, there’s also room for improvement, growth, and development” my entire life. I’m always in search of ways to push myself. My original goal was to just finish the Boston Marathon, but that quickly changed to finishing in under 3.5 hours. I’ve always been a speed type of person, but had never been used to pushing my body to complete long distances. My training has been a step wise increase in weekly mileage, long distance runs, and pace. I started out with a 8-minute pace (fast forward a couple months) and my current marathon goal pace is about 7 minutes/mile. My new goal is to finish the marathon with the Boston Marathon qualifying time for my age (3:05) which means I’ll need to run roughly a 7 minute mile pace. A lot of my motivation stems from my competitive personality and desire to push myself both physically and mentally. In addition, my uncle Dan will be running in Boston this year, so I’m motivated to try and catch him in the race (he’s Wave 2... probably impossible, but aim high miss high). Do you listen to music when you run? If so, which jams get you through your long runs? I’m a huge fan of Dave Matthews Band, so I’ll typically play some of their live tracks during my long runs. However, if I’m in the mood for a laugh, I’ll generally play the Dan Le Batard & Stugotz sports podcast. Lastly, you can never go wrong with some hip-hop, such as Drake, when you hit the extended elevations on the Boston runs. 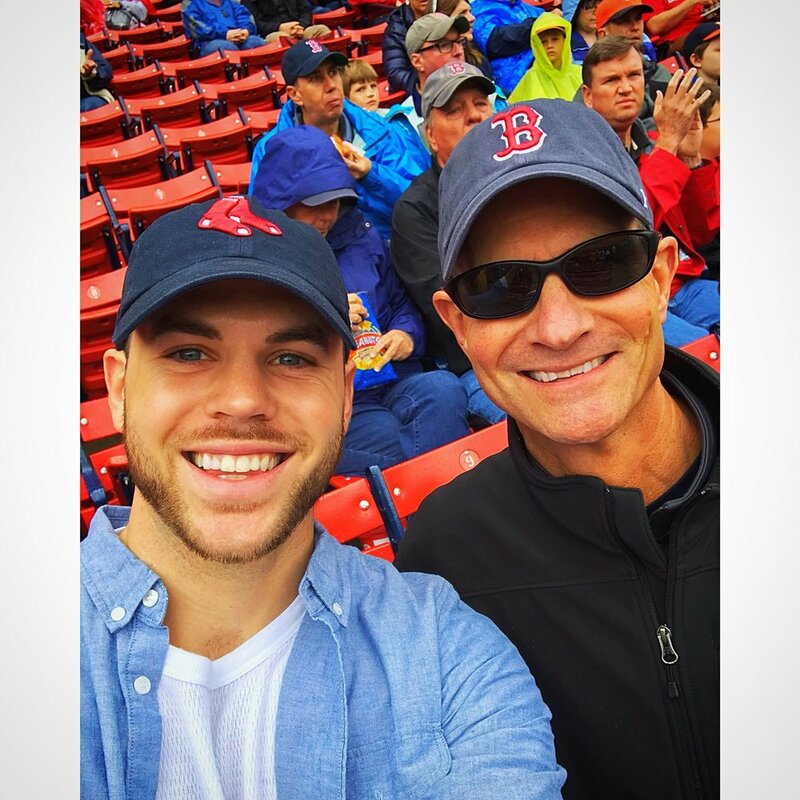 Patrick embracing local sports and culture at a Red Sox game with his dad. As a pending Registered Dietitian (May! ), and aspiring Sports Dietitian, I’m fascinated with the role nutrition and food plays in performance for endurance athletes. I’ve educated several endurance runners on evidence based practices for fueling before/during/after runs and now I finally get to put my words into practice! I make sure I take in the appropriate amount of carbs and protein for recovery, but a Boston Creme donut never fails to satisfy me post long runs. Have you found it hard to balance T1D with running? Running, specifically distance runs, with T1D has always been a struggle. It’s a constant battle with my pump (Do I suspend it? Do I do a temporary basal? ), food (Do I take insulin for my meal? Do I dose for my snacks during runs? ), and checking my blood glucose (How do I use my glucometer during runs? And how I keep it from falling off the treadmill?). However, the Abbott Freestyle Libre system has eliminated much of the stress that running used to bring. The Freestyle Libre system has offered ease and simplicity to checking my sugar during my runs. I’ve been able to monitor my glucose trends during runs and address my needs based on the numbers! Have you found any strategies that have helped with glucose? I’ve found that the Freestyle Libre system has made it easier to check my glucose more regularly during my runs, which has translated into knowing when and what I should use to fuel myself. I check my glucose every 1-2 miles with the Freestyle Libre system and then base my fueling strategies on my glucose trends. I make sure I bring multiple carbohydrate based snacks on my runs, as well as have a carbohydrate-rich meal prior to my runs. What are you looking forward to most about Boston? As a novice, and amateur, endurance runner the Boston Marathon is the pinnacle in terms of marathons. People train their entire lives in order to compete in this race and some of the top runners in the world compete every year. Although I didn’t have to provide a qualifying time, I’m looking forward to competing and running side by side with these great runners. I’ve heard stories of how Marathon Monday is an awesome day and I can’t wait to run down Boylston with my parents cheering me on as I cross the finish. Patrick training through the Boston winter (left)and Courtney running the 2015 Boston Marathon (right). Follow Pat and Courtney's training and race-day updates via Instagram (@pat_0brien and @cjducky). FreeStyle Libre system is not approved for pregnant women, persons on dialysis, or critically-ill population. Sensor placement is not approved for sites other than the back of the arm and standard precautions for transmission of blood borne pathogens should be taken. The built-in blood glucose meter is not for use on dehydrated, hypotensive, in shock, hyperglycemic-hyperosmolar state, with or without ketosis, neonates, critically-ill patients, or for diagnosis or screening of diabetes. Review all product information before use or contact Abbott Toll Free (855-632- 8658) or visit www.freestylelibre.us for detailed indications for use and safety information. Newer PostCongratulations to the 2018-2019 Scholarship Recipients and Finalists!